MarsEdit 4.2 is now available for download from the MarsEdit home page and the Mac App Store. 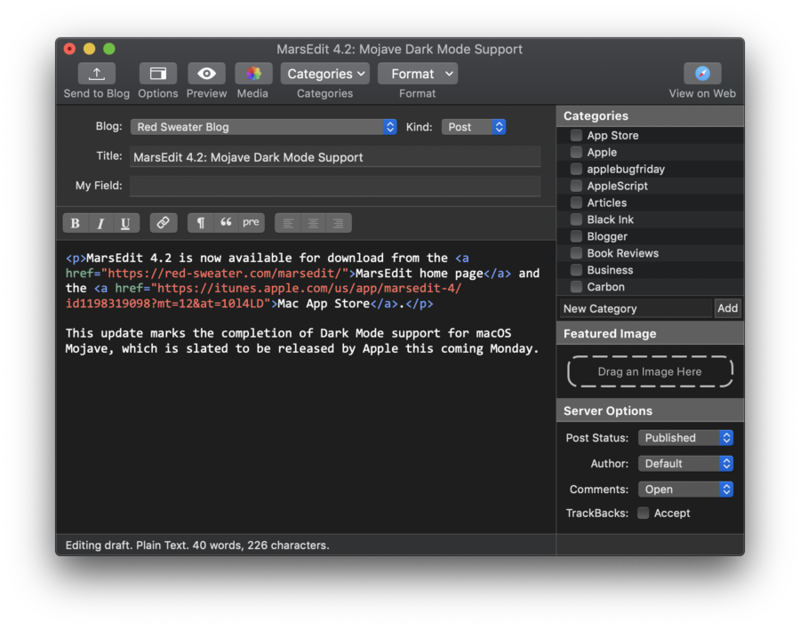 This update marks the completion of Dark Mode support for macOS Mojave, which is slated to be released by Apple this coming Monday. Supporting Dark Mode throughout MarsEdit turned out to be a lot of work, but it was really fun work. It’s great to see how the app can be adapted to a completely different style of user interface. I hope many of you enjoy it after installing macOS Mojave! If you enjoy MarsEdit, please consider writing a review or rating the app on the Mac App Store, spreading the word on Facebook or Twitter, and of course, writing about the app on your own blog! Thanks for your support. This entry was posted to MarsEdit, Red Sweater News. Both comments and pings are currently closed. Thanks for reading!